Crane Walk Corner - Sedgefield Accommodation. The apartment has a Queen-sized bed and walk-in dressing room that provides plenty of space for personal belongings. Ther's a full bathroom (bath & shower) with under-floor heating for the winter chill. There are 2 wall heaters in the open areas. A fully equipped kitchen includes a microwave oven, fridge/freezer, washing machine/tumble drier (combo), hob & under counter oven. A full size grocery cupboard allows you to store all the provisions you may need. There's a comfortable lounge area to watch TV - full DSTV with dual decoder - that has all the regular channels that is independent of the main house. A private outdoor patio has a Swartvlei lagoon view. It has a built-in braai and sun loungers are provided. Off-road parking for a single vehicle is available in the back yard at the foot of the stairs to the apartment. A remote will be given to guests for the automated gate. Crane Walk Corner is within easy walking distance of all the local shops and restaurants. With nature all around you, you can relax and soak up the ambiance and laid back atmosphere of this Slow Town affiliated to Cittaslow in Italy. There is a lot of information about the area available in the apartment and your hosts are on hand to assist you if needed. 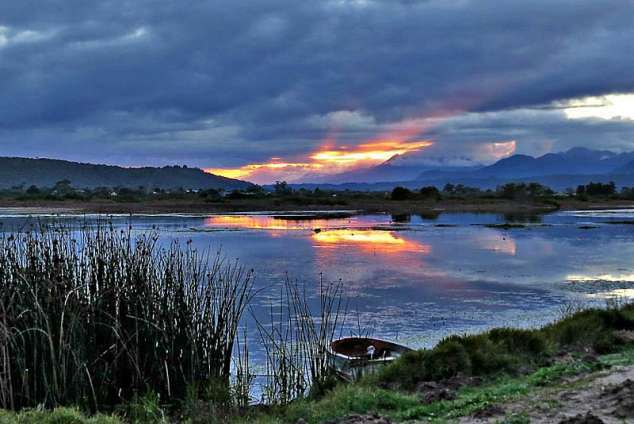 Sedgefield, Africa's first Slow Town is central to the Garden Route and a nature lover's paradise. Surrounded by mountains, lagoons, forests and beaches one can participate in a myriad of outdoor activities such as cycling, mountain biking, canoeing, fishing, swimming, skiing, stand-up paddling(SUPing), hiking, tennis, horse riding, hang-gliding, forest walks, 4 x 4 trails, quad biking and bird-watching, golf, bowls...the list is inexhaustible! Besides these, throughout the year there are a variety of fabulous festivals to enjoy and participate in. eg. The Eden Kite Festival, the Knysna Timber Festival, the Knysna Arts Festival, the Knysna Celtic festival, The Pink Loerie Mardi Gras and Arts Festival, the Garden Route Walking Festival, The Sedgefield Slow Festival, The Knysna Arts Festival, The Knysna Oyster Festival and many more. Retail therapy is available at Sedgefield's three wonderful Saturday Outdoor Markets: Wild Oats Community Farmer's market - on the banks of the Swartvlei Lagoon; Adjacent to it is the Mosaic Village and on the other side of that is Scarab Arts and Crafts Market. There are restaurants to suit all tastes within walking distance from the apartment, a very reasonably priced shop for antique lovers and a vintage car lot with classic car memorabilia. You can also spend a relaxing afternoon at the Health Spa at Lake Pleasant. You can be as energetic or as laid back as you like because there's peace and tranquility aplenty to be found here. Sedgefield is the ideal place to recharge your batteries, breathe deeply of unpolluted air and slow down to the speed of nature. On the N2 coming from Knysna (turn left), from George (turn right) at the one and only traffic light in Sedgefield. On reaching the circle, take the third exit that will bring you out next to the lagoon on Kingfisher Drive. We are the 2nd house on the left. Drive past and double back turning left at the Gum trees onto the dirt road called Crane Walk, after the traffic hump. The No 26 and a Crane's head in mosaic is on the left pillar next to the gate. 449 page views since 28 Feb, 2018. Last updated on 06 Feb, 2019.